Mish's Global Economic Trend Analysis: 2-Year, 10-Year Treasury Yields at Record Lows; Greek 1-Year Yield Tops 72%; Gold Soars $56 to $1882; Bill Gross Anticipates "Twist Again"
2-Year, 10-Year Treasury Yields at Record Lows; Greek 1-Year Yield Tops 72%; Gold Soars $56 to $1882; Bill Gross Anticipates "Twist Again"
Curve Watchers Anonymous is watching the US Yield Curve once again. 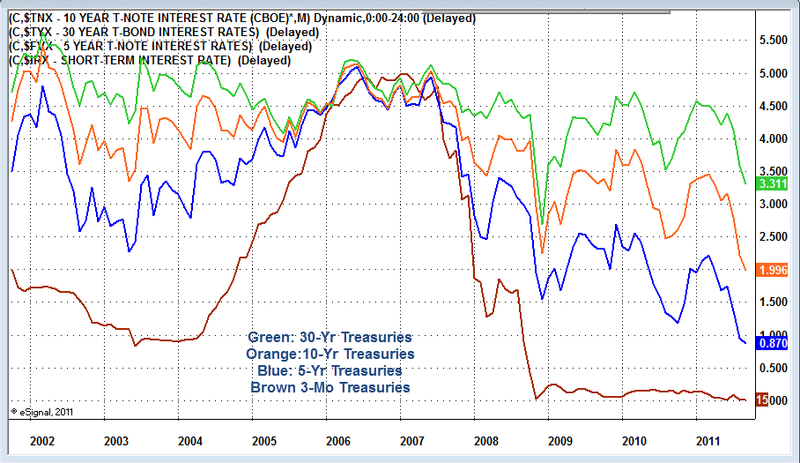 Treasuries soared today (yields plunged) on the "unexpected" news the economy created no jobs. 10-yr treasuries touched a record low on Friday. The entire yield curve from 3 months to 10 year is at or near record lows. The 30-year long bond is lowest since January 2009. One year yield in Greece is pricing in a certain default with a big haircut to boot. Bill Gross Anticipates "Twist Again"
Having missed nearly the entire treasury rally (see Recession Looms in Brazil and Canada; Asia Exports Sink; Global Economy Deteriorates Rapidly led by BRICs; Asia Stagflation; PIMCO Admits Mistake), Bill Gross now likes "longer harder duration". Pacific Investment Management Co.’s Bill Gross said he favors longer-maturity debt with the Federal Reserve likely to seek to narrow the difference between short- and long-term borrowing rates as employment growth stagnates. A government report today showing job growth was flat in August bolstered the view that Fed Chairman Ben S. Bernanke will be inclined to take additional steps beyond the two previous rounds of debt buying, known as quantitative easing, or QE. The central bank will likely extend the maturities of its portfolio by buying five- to 10-year Treasuries while shedding shorter- maturity debt, Gross said, in what has been referred to as “Operation Twist” after a similar program in the 1960s. More stimulus from the Fed may not be beneficial because it risks a political backlash that could threaten to undermine the central bank and weaken the economy by driving up commodity prices, Mohamed A. El-Erian, Pimco’s chief executive officer and co-chief investment officer with Gross, said today on Bloomberg Television’s “In The Loop” with Betty Liu. I frequently disagree with El-Erian but not this time. The 10-Year yield is under 2%. What practical reason can their possibly be and what practical benefit could possibly result from the Fed attempting to drive yields lower? The answer is none, but monetarist clowns still call for the Fed to do just that. 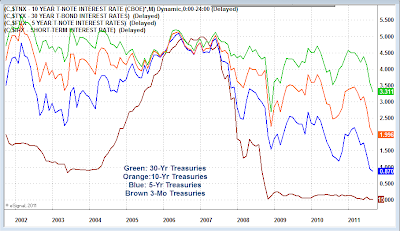 It's time to face the facts Fed monetary stimulus is now useless at best. 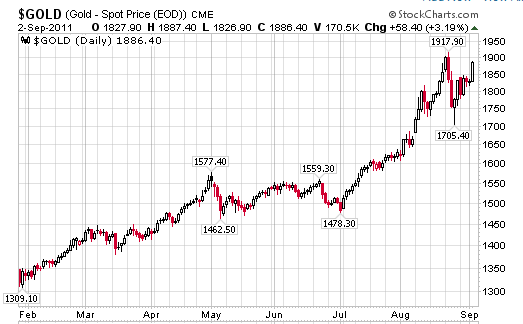 It's also time to face the facts the rally in gold has little if anything to do with inflation. Gold is clearly reacting to further stimulus efforts by the Fed, Eurozone bank stress, or US bank stress. It is always difficult to say "why" something is happening but in this case, bank stress in both the Eurozone and the US is the likely reason for the renewed push higher. Gold may become even more volatile as the ECB and IMF attempt more futile efforts to "save the Euro". These foolish efforts to "save Greece" (in reality save stupid European banks that made foolish loans to Greece) has tripled or quadrupled the pain those banks are going to feel. What may initially have been a 40 billion Euro boondoggle now likely approaches a 150 billion Euro boondoggle and the EU wants to throw yet another 100 billion Euros at it. In the meantime, Italy looks prepared to blow again. How much more of this will citizens of Germany, Finland, and Austria put up with? How much austerity can citizens of Greece, Spain, Portugal, and Italy take? This can easily come to a crisis head as soon as next month, or even next week.